Natural Orange Terpene Solvent is a potent solvent that can be a full-fledged substitute for turpentine, since it dissolves damar resin solids, hardened paint, etc. It is free of aromatic and chlorinated hydrocarbons. However, like many natural essential oils, it can have a sensitizing effect on sensitive artists if it is used too liberally. Therefore it should be used only in well-ventilated areas for those tasks where its use is unavoidable. 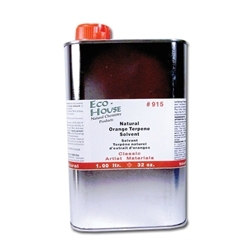 Mixable with other Eco-House solvents in any desired ratio.